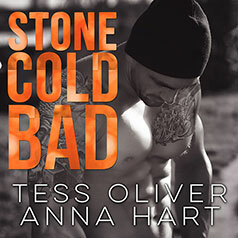 New York Times bestselling author Tess Oliver and Anna Hart present Stone Cold Bad, the first novel of the Stone Brothers series. Contains mature themes. Bad boy Colt Stone has a notorious reputation for being a tough and dangerous heartbreaker. A brutal childhood hardened him to the idea of any type of emotional attachment to anyone. When he becomes the unwitting accomplice in Jade Morrow's escape from an abusive boyfriend, he soon finds that he'll do anything to keep her safe. Has Colt found the one girl who can break through to his impenetrable heart?